Energiatesti | Kuinka energinen olet? The Energy test is a comprehensive mapping of well-being and well-being that you can do either by yourself or by the whole community. 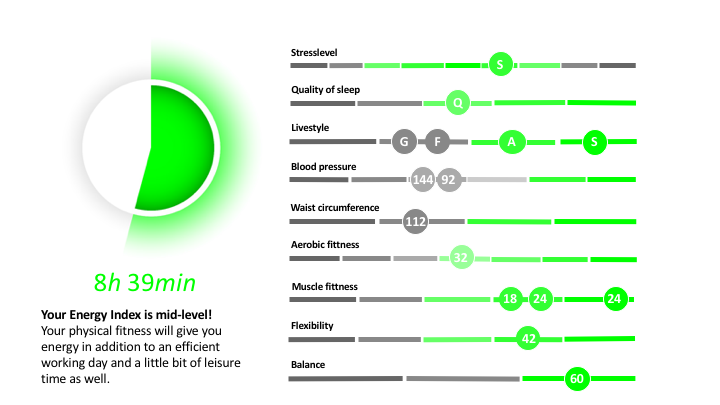 The Energy test provides information on health status, body performance, and hence the overall energy level. The health assessments used in the test and the Energy index calculation model are based on extensive international science data. The Energy test is a patented and award winning welfare analysis. The Energy test consists of three components: welfare issues, body measurements and a light fitness test. It is easy to get the Energy test regardless of fitness level. The Energy test can be done easily at home through Energy Service or as a guided team test. We also offer tailor-made Energy Coaching services to work communities, together with a comprehensive service network throughout Finland. You can change the subtitles in English in the settings. The settings appear in the full screen mode. The results are ready right after the test. The participant gets his own Energy Index, which tells in hours and minutes how long it takes to work, have fun or enjoy free time. Each participant also receives their own Individual Report, which contains the results of each test subsection. The results are easily interpretable, because the more green the better. 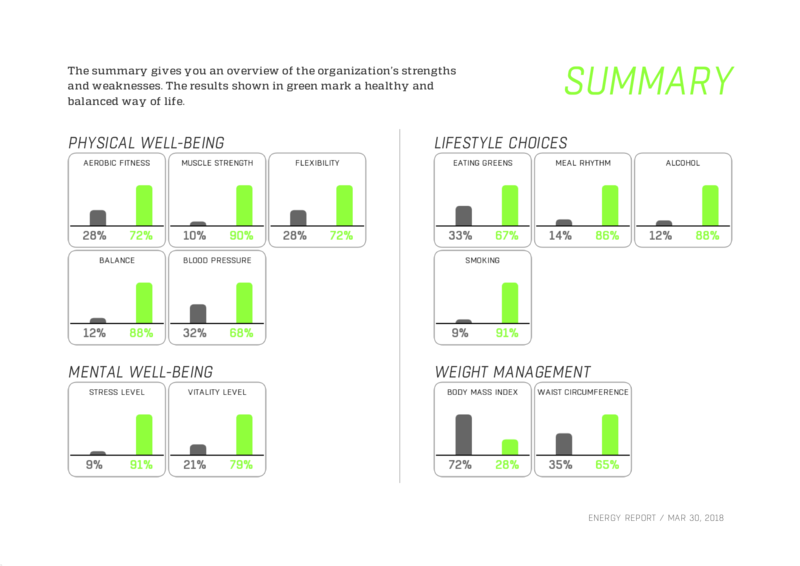 Gray shows the areas that improve well-being and well-being. The working communities also receive a Group Report, which describes the overall well-being and well-being of the work community. Best of all, measuring and monitoring wellbeing and stress is easy. By conducting the Energy test regularly, the development of the situation is seen quickly and the results are directly comparable. As a result of the Energy test, everybody knows how much their current well-being gives energetic hours and minutes to day. As a fun addition, the test tells us finally which animal is closest to us from energy level. In the group were often found in the entire zoo from koalas to bunnies, which lifts a smile to the lips. Well-being at work is not a single measure or recreation day, but a continuous, common sense developed around them. Energy coaching started with 88% of enthusiast employment, and co-operation with Laturi was excellent throughout the project. Overall, our staff improved their energy level within three months for almost two hours, which is a great achievement. In addition, we reduced the half of the sick absence during the project, which paid us back this well-being investment many times. It was surprising how much positive energy and attitude, enthusiasm, and team spirit this energy training project brought to the company while improving the health. When the Energy Test is done for the first time, it indicates the starting level for human well-being. Everyone sees their own weaknesses and strengths. In the future, when the test is done again, it sees progress – and it is of interest to everyone. I believe that the Energy Test and the challenges developed by it have already paid off. Above all, the management team has been united and the team’s cooperation has improved. Some of the employees’ spouses and adult children have joined, and this is where the community is born. Community affiliation is a better thing to do, better cooperation that will bring results. The Energy test is available from us and service providers all over Finland. The prices are valid in Finland. Comprehensive mapping of well-being and well-being quickly and easily online. Comprehensive well-being and well-being mapping as a team test under the guidance of a coach, in groups of 10 people, for example at your workplace. According to your wishes, a tailor-made coaching package. Inventory of comprehensive well-being and wellbeing, support for development and follow-up. Two Power Test ™, Online or Guided: Start-up and Tracking Test. Based on the results, tailor-made coaching packages at the individual or group level. Online and / or controlled by a coach. Laturi Corporation Ltd is a welfare technology company established in Oulu in 2012. Laturi has extensive expertise in technology, health and physical activity. We work together with leading service providers in the field of wellness. Together with our partners, we will bring more power to work communities through innovative solutions for well-being at work. High quality, easy and cost-effective. The Energy test is a patented and award-winning product developed by Laturi, which has already inspired hundreds of work communities around Finland to measure and monitor their well-being.